Levy Park is an inclusive, safe space to connect, experience, do, and play. 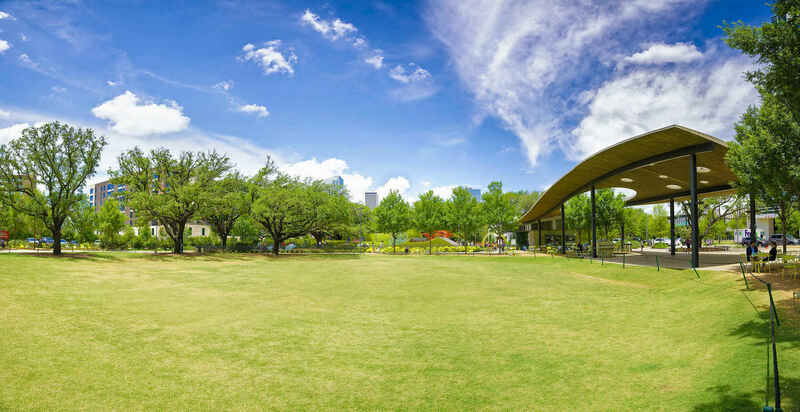 Located in the heart of the Upper Kirby District of Houston, the park is home to over a dozen free, recurring programs in health and wellness, education, arts and culture, and music curated to meet the needs of the community. The park's amenities such as the dog park, Children's Park, interactive water feature, performance pavilion, event and activities lawns, and community garden are enjoyed by 5,000 to 10,000 visitors a week. Levy Park is a public, City of Houston park maintained by the Levy Park Conservancy, a private, nonprofit organization responsible for the maintenance, operation, and programming of the park. Your contribution supports the maintenance and operation of this world class destination. Located in the heart of the Upper Kirby District of Houston, Levy Park is the result of a 1941 bequest from the estate of Leon Levy. In 2015, the Upper Kirby Redevelopment Authority, in partnership with the Upper Kirby District Foundation, undertook the transformation of Levy Park. Since the park's grand re-opening in early 2017, Levy Park has become a place of respite, play, and inspiration for all those who visit. Learn more about Levy Park at levyparkhouston.org or contact us at info@levyparkhouston.org. Follow Levy Park on Facebook, Instagram, and Twitter @levyparkhouston. We adore Levy Park and love the diversity of people coming there! In celebration of the internationally renown, award-winning Levy Park and the best staff ever! Levy Park is an incredible public space in Houston and I’m glad to have it here. Such a wonderful space on Houston that is open to everyone! I'm giving because I love this park. My dream is that every area of Houston could have a park like this.